Awful news reading that so many are dying. It must end NOW. "... destined for ocean theme parks in china..."
china is reported to have some 60 marine theme parks with another 12 under construction!!! "Russian prosecutors are investigating the capture of beluga whales and orcas!!! 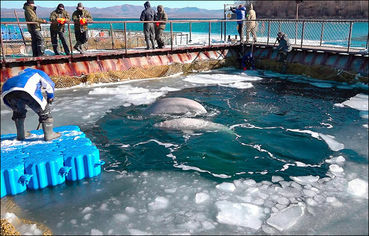 According to local media and the investigative newspaper Novaya Gazeta, more than 100 whales are being held in pens in Srednyaya Bay, near the city of Nakhodka, more than 100 whales are being held in pens" !!!! Signed, shared and noted. Thank you, Marty and Animae. Signed the Change petition previously and I think one or more on Care2. Thanks!